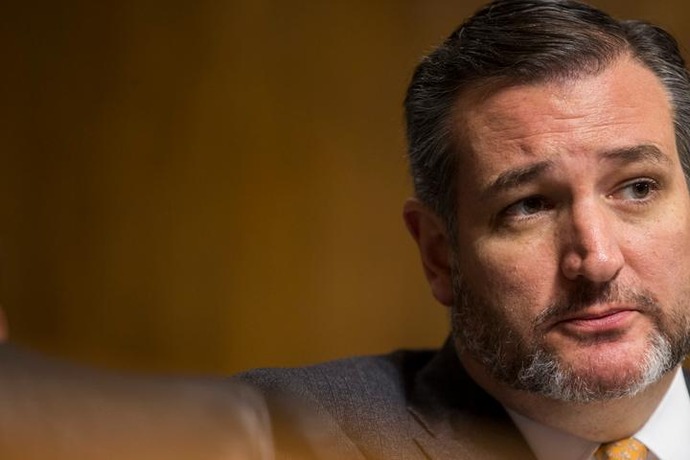 Sen. Ted Cruz and his weird beard just got called out on the U.S. Senate floor by Colorado Sen. Michael Bennet over the fight to reopen the federal government. On Thursday, Cruz claimed that obstruction by Democrats was the only thing keeping the government from reopening and getting federal workers like Coast Guard employees their paycheck. His remarks came ahead of a vote on a bill that could have brought an end to the current government shutdown by giving President Trump his demanded $5.7 billion in border wall funding. That's when Bennet stood up and took umbrage with what he called Cruz's "crocodile tears" in an impassioned, scathing indictment of Cruz's history with shutdowns. That 2013 shutdown was some chicanery led by Cruz in an attempt to take away funding of then-President Obama's Affordable Care Act. The move is probably most remembered for two things: Cruz reading Green Eggs and Ham during a filibuster and the whole thing ending poorly for Cruz with the publicly largely blaming Republicans for the 16-day shutdown. The deadly floods Bennet referred to took place in early Sept. 2013, three weeks before the shutdown started on Oct. 1, 2013. But the shutdown greatly impacted funding flood recovery efforts in the wake of the disaster. Extra relief for Colorado was part of the bill that ended that 2013 shutdown but recovery efforts are still ongoing and have been impacted by this shutdown, over five years later. In the end, the Senate failed to pass either bill to reopen the government on Thursday, so the current shutdown continues and Ted Cruz continues to be the senator nobody likes.